The books young children are typically given at school are called “Levelled Books”, which are used in class for “guided reading” or “shared reading”, where a teacher and a group of children read a book together, and discuss it. They’re also used as home readers. Teachers typically encourage children to use a range of different strategies while reading these books, including guessing words from picture cues, first letters and context (e.g. “what word would make sense there?”), plus sounding words out, though often only as a last resort (perhaps thanks to the lasting influence of Dame Marie Clay, author of Reading Recovery and the Observation Survey still widely used in schools). Have child-centred high-interest non-fiction that’s clear, logical and superbly illustrated. I’m happy about the last two points, good on them. I’m very unhappy about the fact that these readers introduce sound-letter correspondences and syllable types in what can only described as a random fashion. They simply do not have a sound-letter link teaching sequence. As I’ve said in previous blog posts (here, here and here), I also have a real problem with teaching children to memorise rather than decode high-frequency words, and introducing high-frequency words in order of frequency. The word “birthday” might appear more frequently in children’s books and free writing than the word “man” (numbers 80 and 157 on the Oxford Wordlist, respectively) but “man” is an easy word to decode and spell, so there’s no need to memorise it, and “birthday” has two syllables and three digraphs, so should be introduced later. I’m also very unhappy about children being encouraged to “read” repetitive books by guessing from pictures rather than sounding out the words. This is what levelled books mostly seem to be set up to encourage. In fact, for little kids, there is no other way to read them, because they contain too many long words and hard spellings. Many young children thus manage to mask their serious problems with sounding out words for a very long time by being good at guessing from first letters and pictures. If you have an iPad, you can now download some free PM Readers from the apps store, and check them out as examples of typical levelled books for yourself. The first one in the Starters series goes like this: Big things. A truck is big. 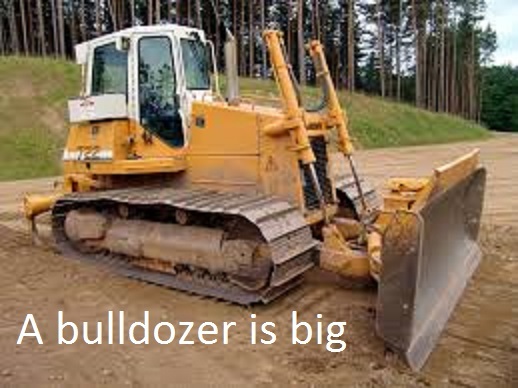 A bulldozer is big, then it repeats the “A…is big” sentence frame for other vehicles: train, fire engine, bus, crane, ship and plane. The pictures are very nice, much better than the ones in this blog post – I didn’t want to use theirs for copyright reasons. b as in “big”, “bulldozer”, and “bus”. i as in “is”, “big”, “things”, and “ship”. s as in “things” and “is” (sounds like “z”). t as in “truck” and “train”. r as in “truck”, “train” and “crane”. u as in “truck” and “bus”. n as in “train”, “engine”, “crane” and “plane”. r as in “fire” (in Australian English this is the unstressed vowel, pronounced “uh”). g as in “engine” (pronounced “j”). i…e as in “engine” (again the unstressed vowel, pronounced “uh”). p as in “ship” and “plane”. That’s 31 different sound-letter correspondences including several digraphs, one syllable words with five different syllable types (V, VC, CVC, CVCC, CCVC), two-syllable and three-syllable words, some incorporating the unstressed vowel. Most patterns appear only once or twice, so there’s not much chance to learn any of them. On the iPad there are a lot of bells and whistles like voice output that make this more like a game or toy than a book. As a paper book, this sort of thing is really not suitable for beginning readers. I’d only ever use it as a picture book for a vehicle-obsessed younger child who is not yet starting to learn about sounds and letters. Such books are based on the jump-the-shark Whole Language idea that reading and writing are natural and should be “caught not taught”. We now know that many kids won’t learn very well without explicit, structured teaching about how sounds in our speech are represented by letters on the page. This requires a proper teaching sequence for sounds and letters, and decodable books which contain the sound-letter links which have been taught, rather than levelled books of the type now widely used. This entry was posted in books, phonics activities, sound-letter links, sounds, spellings, teaching strategies, whole language on February 18, 2016 by alison. As always, Alison, your analysis gets right to the point. Young children can memorise these repetitive structures quite easily, which makes it look as if they can read when they can do no such thing. As you suggest, it masks the underlying lack of skills, understanding of how the code works and basic code knowledge. These books are no different from the old Janet and John formula. But, it is very difficult to convince people who are blown away by pretty pictures and by texts that they, as adults, can read easily. Providing a clear breakdown of exactly how complex the words in these ‘simple’ texts are is, I suspect, a help. I was doing my Japanese homework last night, in hiragana. Each character with a few exceptions makes one group of sounds, always the same. The exceptions are variations where sounds have been dropped from the spoken language. I’m still a beginner at Japanese but I can read and pronounce words I don’t know correctly, and write from dictation reasonably accurately. I’m quite glad the Japanese never adopted our spelling system. Hi there, thanks for your blog. As a kinder teacher I find it useful. Is there a phonics program that you would recommend for preschool, to use in playful, very short doses, amongst all the fun, meaningful, language activities we already do such as big focus on rhyme, clapping syllables, listen for beginning sound etc. Thank you for this and especially for the link where book levels are questioned. That is something I am very interested in. We are in the UK where the school my daughter attends subscribes heavily to Reading Recovery and what you call “caught not taught”, I like that phrase. Anyway, thank you, I will share with other parents who have children at the school. Your analyse is worth thousands of my rants. I was a Reading Recovery teacher for ten years and hold its founder, Marie Clay, in high esteem. She would say we must read for meaning, and that means being able to decode what is on the page. BUT she does not want kids to be given books that only use words they can easily decode by sounding out! If you do that, kids then have to read terrible books that manipulate sentences to only use the words the child can easily use. Try getting a Prep child to be enthusiastic about reading: “the man has a fan. He has it in his van.”……etc. show him the PM reader with all the vehicles and he will instantly experience “success” in reading. He uses a combination of the picture clues, combined with the first letters of words, makes predictions, cross-checks for meaning, makes sure the context fits the word and develops skills for lifetime reading. Reading is SO much more than being able to decode letters. Kids who rely on sounding out too heavily become easily stuck once words like “laugh”, “thought” “said” come along. Please give kids well-constructed books to learn from. Hi Val, sorry to take ages to reply, I’ve been snowed under. I think your comment is best answered with reference to the reading research (see this article for example), which shows the importance of teaching and practising sound-letter correspondences systematically at the beginning of teaching reading, but then of course moving on to reading books without controlled spellings and more diverse and complex vocabulary. Your quote marks around the word “success” are instructive. Children don’t just want the impression of success at reading, they want to really get the words right, without having to rely on the crutches of weak readers like predictable sentence frames and pictures, which are soon removed, and leave many kids (e.g. the kids I work with) stranded. Of course reading is more than decoding, nobody disagrees with that. But decoding is foundational and non-negotiable to skilled reading, and the early PM style readers are simply not helpful to children with weak phonemic awareness who struggle to learn to decode.